Why do people move to the suburbs? Maybe the city’s gotten too noisy, they want to raise kids where there’s more more room for them to run around. Maybe the schools are better in the ‘burbs. Maybe city life is just too expensive, even if you work in the city and have to commute in every day. Guess what? If you’re a shrimp or a herring, it works pretty much the same. Tidepools are the ocean’s Manhattan: crowded, turbulent, noisy and full of weird feisty characters. If the tidepools are the ocean’s ecosystem that never sleeps, then the nearby bays and estuaries are the quiet, idyllic suburbs. But like most actual suburbs, there’s a lot more than meets the eye. Here’s what’s going on in those “quiet” bays at the ocean’s edge. Tidepools and nearshore waters are full of densely packed weird characters. If you’re a small sea creature, most of them are dangerous. Anemones pack stinging cells, sea stars rip mussells apart, snails drill through shells, and sharks patrol the continental shelf. By comparison, the predators bays and river mouths are fewer and far between. Great blue herons, osprey, salmon and the occasional leopard shark will grab fish, and gulls will eat anything. But it’s a safe neighborhood by comparison. If you’re trying to raise kids away from predators, bays are the place. And space is cheap in the bays and estuaries. Unlike tidepools where everything is fighting for space on the rocks, and crevices with protection from waves and predators are highly sought after, in ocean’s the suburbs there’s broad expanses of sandy bottoms and mudflats. The soft material means it’s easy to burrow, and since you can dig yourself into the sand, the cost of housing—needing a hard shell to protect you from the waves and predators—is much lower. Bay creatures like softshell crabs, shrimp, worms and amphipods invest a small faction of their energy in hard shells compared to the armored existence of barnacles and mussels. We’ve all seen suburbs where every house was built by the same developer and a homeowner’s association makes sure they’re all painted the same color. 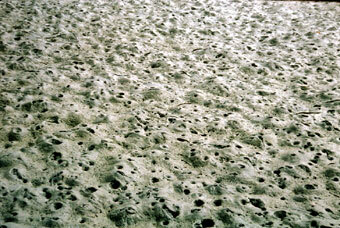 A look at the mudflats of a bay will reveal the same thing: row upon row of what look like miniature volcano holes. They’re made by the bay’s two prime construction firms, the ghost shrimp and blue mud shrimp. The shrimp dig tunnels into the soft mud. The tunnels provide a place to hide from water and currents, and they’ll often sit on their “front porch” and grab food out of the water column. The tunnels offer hideaways from visually-driven predators like herons and gulls. But they’re still vulnerable to marauding thieves like crabs and predatory fish. And the tunnels take constant maintenance. Which means it’s time to find some good hired help. To deal with the endless burrow maintenance and security issues, the ghost shrimp simply hires landscaping and private security firms. In exchange for free lodging in its tunnel, a fish called the goby and scale worms eat the detritus that collects in the burrows. The pea crab is the Ghost Shrimp’s hired security, getting food in exchange in exchange for being an armored burrow guard. Bays and estuaries even sport the vast green lawns we associate with human suburbs. They take two forms: beds of eelgrass, and salt marshes. Eelgrass is a rooted plant that anchors in the sandy bottom: like whales, eelgrass lived on land and then evolved back into the water. Salt marshes have learned to tolerate the perpetual drying-and-covering on the bay’s edges. And eelgrass and salt marshes are what give the suburbs good “schools”—schools of fish. Eelgrass and salt marshes provide lots of nutrients, protection from the ocean’s raw power, and places to hide from predators. So it should be no surprise than many fish rely on them. Even fish we associate with oceans or rivers—flounder, salmon, herring, and shrimp—spend part of their lives in eelgrass beds. In fact, over 70% of fish caught commercially in the open sea have spent time in an eelgrass bed, making these beds them critical for sustaining our fisheries. Like real suburbs, the ocean’s burbs are known for a combination of high incomes and its cousin, high taxes. The high income comes in the forms of lots of nutrients. Rivers are perpetually dumping nutrients into bays where the slow water allows it to settle into the sand at the bottom. Ocean waves wash in piles of kelp and nutrients from the continental shelf. While the food conveyer belt runs both ways, it also comes with a bit of a tax. The perpetual mixing and shifting of fresh and salt water requires constant adaptation to changes in the water’s height and salt content—which creatures have to adapt to by digging deeper, moving closer or further from the mouth of the bay, adapting their physiology, or shutting down for a few hours. All of those come at a metabolic cost. And then there’s the most frustrating part of the suburbanites’ existence: the commute into the city for work. Not surprisingly, the same phenomenon exists in the ocean: many fish shelter in the calm water of the bay and then move into the ocean to feed. The frustration isn’t traffic, though. It’s currents: tidal currents will accelerate at the mouth of the bay, making commuting at the wrong time of the tidal cycle difficult or impossible. And the narrow mouths of bays can be a funnel for predators, who can wait to pick off preoccupied commuters focused on getting to work. So next time you’re looking at a quiet bay, imagine a bunch of oceanic soccer moms shuttling their fishy kids to school in the eelgrass beds and dealing with the gardeners maintaining their oceanic burrows. Maybe life in the suburbs is exactly what we think it is.